what is type of sale support by programe ? You could move the dishes from the table to the other? Does the program supports the system of discounts? You can customize the form of the hall within the program? By providing comprehensive restaurant and food service outlet point-of-sale (POS) at every type and size of restaurant, whether you operate a single restaurant or hundreds. Flexible & Fast, Specific interface for each one of “Take Away – Dine In – Delivery“ , Check previous Orders, make Free Order & Dishes, make Order Discount & Dishes Discount, Dishes Option to ensure the favorite taste for customers, Record Order as Debt, work with barcode reader, Minimum Charge For Dine In Order. Table Design, Table Reservation, Move Order or Dishes from Table to another, Merge Tables, Tables Waiter & Casher definition. Customer details definition, multiple addresses by customer, Street and Area Creating, Automatic Delivery Charge, Giving Order to Delivery Man, Suitably with Caller ID Device, order history is stored for easy retrieval, Ability to manage and guarantee delivery times to increase customer satisfaction. Full items controls by users to add, remove, update, and design. Dish prices & preparation times for each one of “Take Away – Dine In – Delivery”. Dish schedule by days & hours. Dish Items to count consumption, cost, and profit. The Handheld Maestro can improve customer service by enabling your servers to stay on the floor where they’re needed and allow them to focus on serving customers, rather than running back and forth. Monitor Display system sends orders to kitchen staff instantly, simplify order preparation, ensure order accuracy, and decrease the average time it takes to complete an order. Smart Print System Is available too for small restaurant that using kitchen printers. To entice your customers to come back over and over again, Maestro have developed features “Points System & Coupons” which will get you faster to that goal. The Caller ID feature brings you directly to the customer’s file to speed up service. Call reception with Caller ID fasten your operations of order taking, order processing, handling of customer inquiries and complaints allows for a more focused, efficient and fast delivery operation. With Maestro Call center you will be able to forward your orders from your call center to other branches, and it will allow you to track orders from branches which will enhance your service quality and delivery performance. Maestro supports Arabic and English Interfaces. The system has been designed to support any other language on demand. Since the entire staff restaurant (such as Director - Accountant - Cashier - Chef Captains and staff delivery) share work on Maestro therefore had to be a security system at a high level of accuracy where we can customize every button in the program to the user without the other. Maestro offers huge number of reports for you to control and improve the work flow, the reports can be exported with a click to excel format, with the ability to send those reports by email automatically. 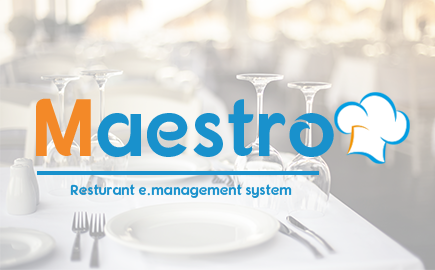 With Maestro you can run multiple restaurants with or without centralization, and control the Branches no matter how much distance between them. Bind menu items to stock items and specifying the quantity based on every menu item and automatically decreasing the stock items balances based on orders, and know the quantities in the stock momentary. With +Master You will enjoy integrated accounting system, purchases, stakes, Flexible material chart & account chart, inventory identity by simple operation, accounting And stock reports, and final accounting reports which will showed your Profit & Cost momentary, and Financial Centre. With +Novatime you will monitor Time staff and follow up their vacations and salaries of course simultaneously.